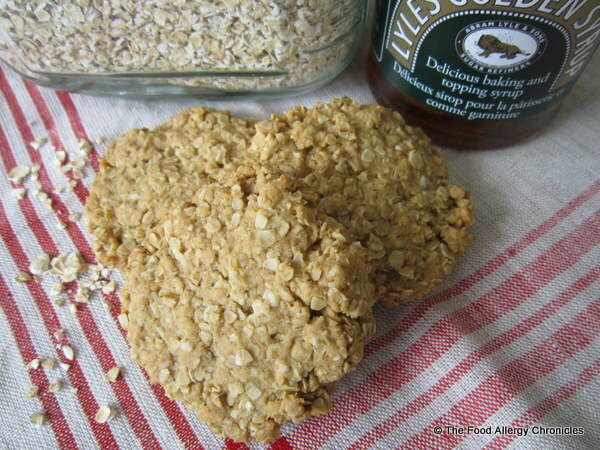 Posted on April 3, 2013 by Susan H.
I have come by my love of oatmeal and ‘sweet syrup’ honestly…I am of British stock…my parents emigrated to Canada in the mid 1960’s. My Scottish grandfather used to soak a bowl of oatmeal every night before bed for his morning breakfast…a tradition my son, Matthew, continues. Although, Matthew does not soak the oats…he does enjoy a big hearty bowl of oatmeal with milk and drizzled with pure maple syrup…our Canadian version of ‘golden syrup’. 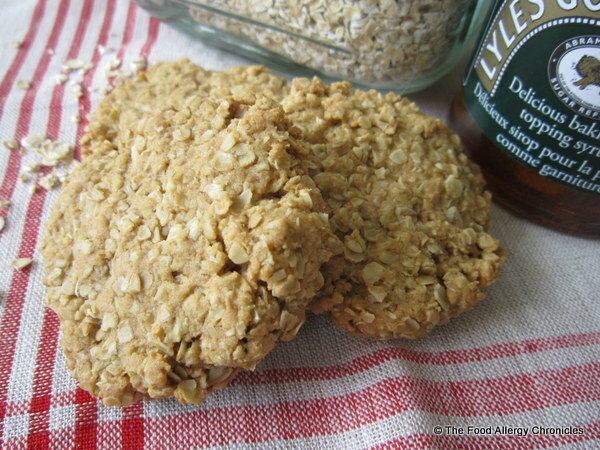 I have always been drawn to recipes that incorporate the use of oats…oatmeal cookies, oatmeal bars, oatmeal crisps, crumbles and of course, a hot steaming bowl of good old oatmeal…I love the rich taste of sweetened toasted oats! It is with great pleasure that I have finally come to adapt an oatmeal recipe handed down by my Scottish Granny, to her daughter, my Aunt Mary. To this day, my Aunt Mary bakes these cookies for all my Scottish relatives to enjoy that are still living in a small town in Scotland. 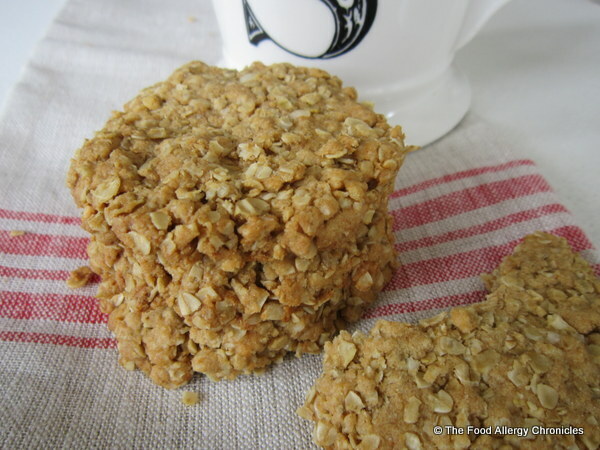 My Aunt Mary’s Oatmeal ‘Flapjack’ Cookies have stood the test of time…I can still remember enjoying them on all my visits back ‘home’ to see all my Scottish relatives. Melt the above ingredients and then add to the mixed ingredients listed below. Combine all ingredients and then shape into a ball and flatten into a disc. Tip: For the first batch…I just left the dough in the shape of a ball. My mother informed me that my Aunt Mary’s cookies are more of the shape of a ‘Hobnob’. Click here for a picture. I found the ingredients to be too dry by the second batch…so I added 2 tbsp of water to the mixture…a bit sticky to work with…and then shaped them on the cookie sheet into a flattened disc…much like a ‘Hobnob’. By the time I was ready to shape the third and final batch…the cookie dough was much easier to shape. Bake at 350 F for 15 – 20 minutes or until golden brown. Cool on baking sheet for 10 minutes before transferring them to a cooling rack. Delish…rich tasting with that great toasty oat taste…just like Aunt Mary’s! Although, I sure would love a hands-on tutorial…I must get my baking gene from her! P.S. I know just the couple that will enjoy a package of these ‘British treats’. There is something so comforting about oatmeal…with a cup of tea…perfection! 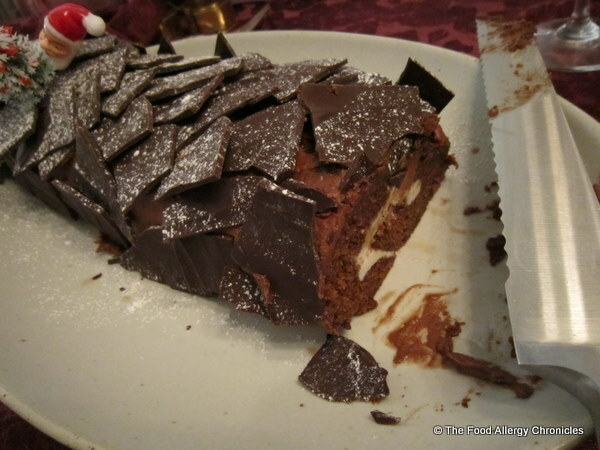 Posted on December 25, 2011 by Susan H.
A Christmas tradition, I am so happy to be able to recreate, is serving a Yule Log for dessert on Christmas Day. Last year, was my first year attempting to put one together. 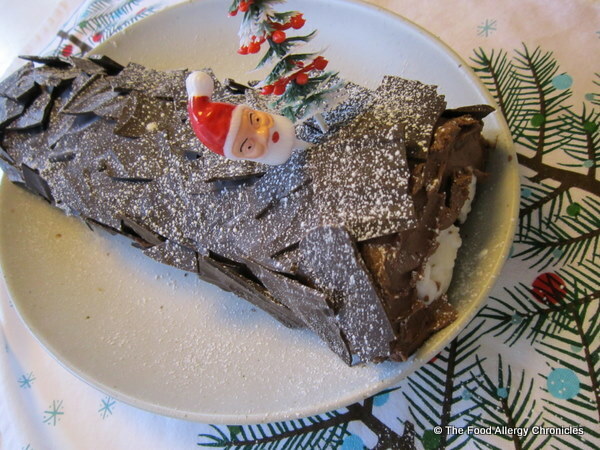 The idea was sparked by Guardian Angel’s Allergen Free Yule Logs. I believe, it was in my Allergic Living magazine, that I first spied Guardian Angel’s advertisement for their Allergen Free Chocolate Christmas Log. I was so excited…even more excited when I was able to purchase one for our Christmas dinner. Located in the freezer section at Metro. Our first store-bought cake…I kept it as a surprise…I came out with it on a platter still in the protective wrapping. Oh, the look on my boys’ faces when they realized what was being presented for dessert. As much as they loved the idea of a cake from outside of our kitchen and the fact it tasted good…they informed me that they liked my cakes better…in particular, my icing. 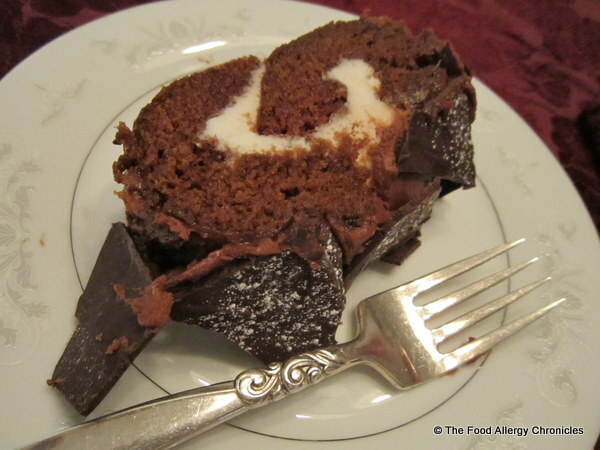 I was determined to create our own Allergen Free Christmas Yule Log. Half the recipe for Dairy, Egg and Peanut/Tree Nut Free Chocolate Birthday Cake. 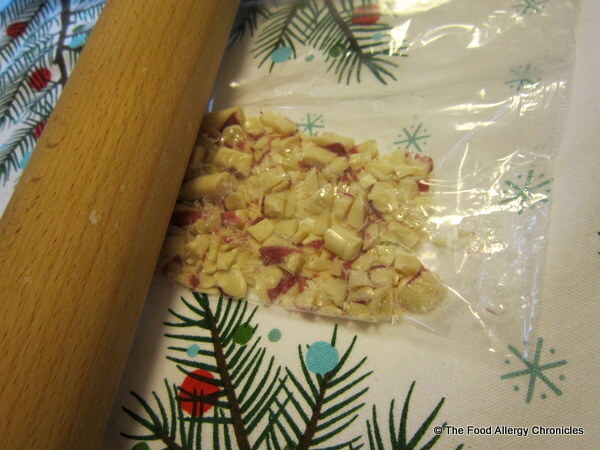 Line a 1″ deep jelly roll pan (approximately 9 by 13″) with parchment paper and spray with canola oil. Pour batter into pan and spread evenly. Bake 350 F for 12-15 minutes. Let cool in pan for 10 minutes. Turn cake out on an icing sugar lined tea towel. Sprinkle with icing sugar and roll cake up carefully from the long end. Make half the recipe of Dairy Free Vanilla Icing and Chocolate Icing. I added a bit more water to each of the icings so it was easier to spread on the cake. 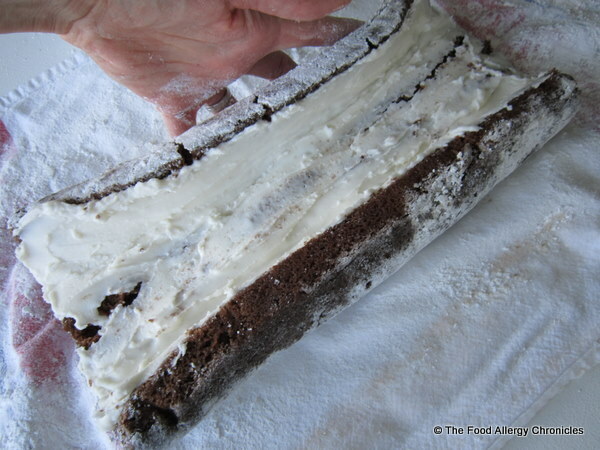 Spread the cake with Dairy Free Vanilla Icing…pushing together the cracked edges and spreading icing to cover. See…no problem! 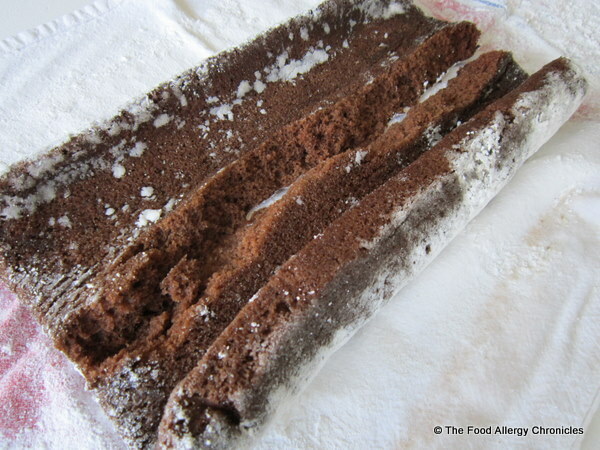 Carefully roll up cake and wrap snuggly with plastic wrap and refrigerate. Unwrap plastic wrap from cake and spread with Dairy Free Chocolate Icing. Last year, I spread the cake with the Dairy Free Chocolate Icing to look rough like bark, sprinkled it with icing sugar and decorated it with a Santa and Christmas tree. 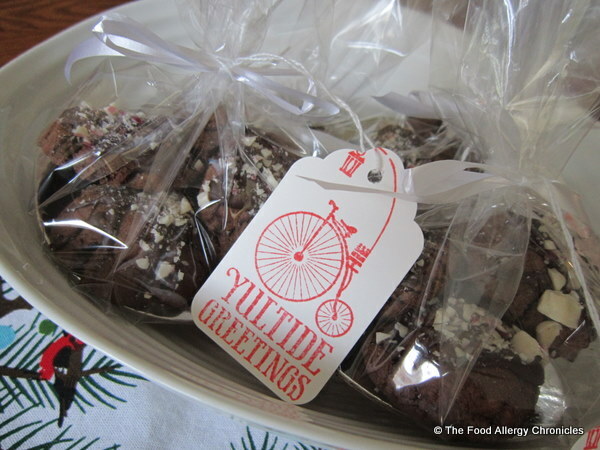 This year, I couldn’t resist trying something different…chocolate bark! 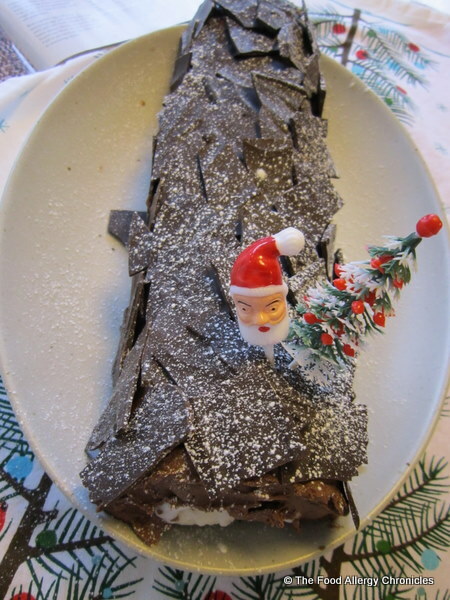 The idea for covering the Yule Log with chocolate bark came from a recipe from the Canadian Living Special Cookbook Edition, Fall 2011. When I saw the picture with the log covered in chocolate bark…I had to try it. So glad I did! Easy to do and it looks terrific! In a bowl over a saucepan of hot water, melt 1 cup of Enjoy Life chocolate chips. 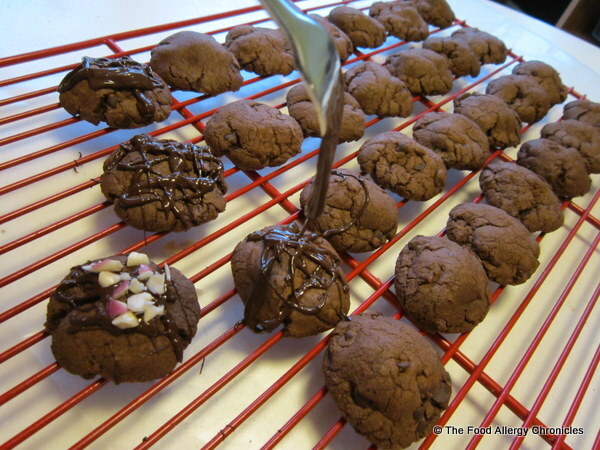 Spread the melted chocolate to a thickness of 3 mm on a parchment lined cookie sheet. Break the chocolate into 3 by 1″ pieces, cover with plastic wrap and refrigerate until firm. Press the broken pieces of chocolate on to the iced cake and dust with icing sugar. Not quite sure how well the cake will cut with all the broken chocolate on it. Will update after Christmas. Update: Dairy, Egg and Peanut/Tree Nut Free Chocolate Yule Log was scrumpdillicious! Is that a word? It is now! 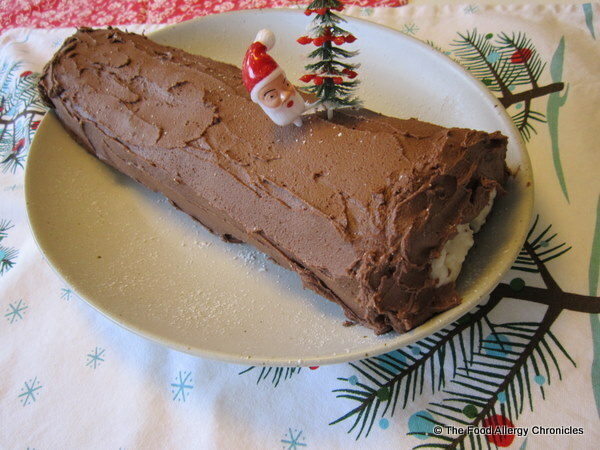 Slicing the Yule Log wasn’t as difficult as I had imagined…just make sure the cake is kept cool for slicing…I used a bread knife. Everyone loved the chocolate bark! A very tasty addition. Inviting the neighbourhood kids in this afternoon, to share what’s left of the Dairy, Egg and Peanut/Tree Nut Free Chocolate Yule Log, after the boys have a game of road hockey. Tip: For a Soy Free Icing use Earth Balance Soy Free Vegan Spread. P.S. I am putting together an Allergen Friendly Christmas Dinner for Michael to take to my in-laws: Roast Turkey with Dairy Free Gravy and Stuffing and Dairy Free Garlic Mashed Potatoes. I made the Dairy Free Stuffing the day before so it was ready to stuff the turkey early in the morning. Can you believe, I was able to pick fresh parsley from my garden for the stuffing! I will also be bringing a Dairy and Peanut/Tree Nut Free French Stick for everyone to enjoy. Will be bringing a cutting board and bread knife. P.P.S. Do you have a favourite recipe you have adapted for your Christmas dessert or dessert in general? 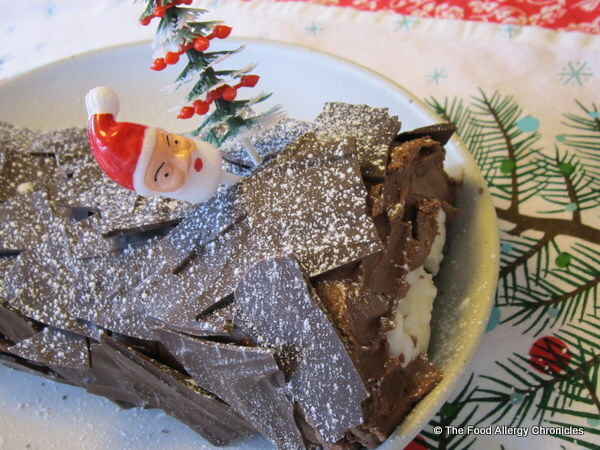 Have you tried the Guardian Angel Christmas Logs? 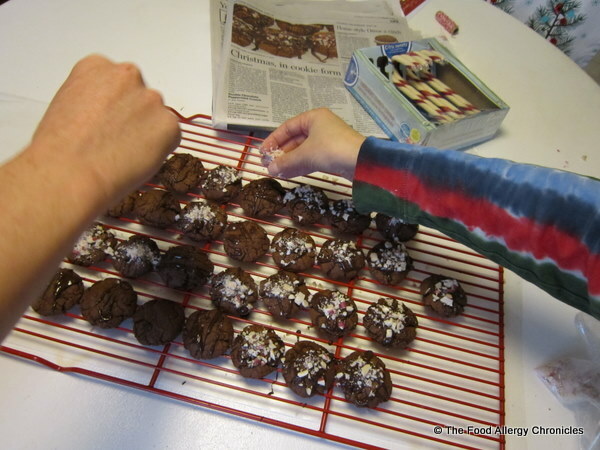 Posted on December 23, 2011 by Susan H.
The Toronto Star’s Cookie Calendar, Day 17 cookie, caught my eye…I knew my boys would go gaga over them…so I adapted them to meet their allergen needs. 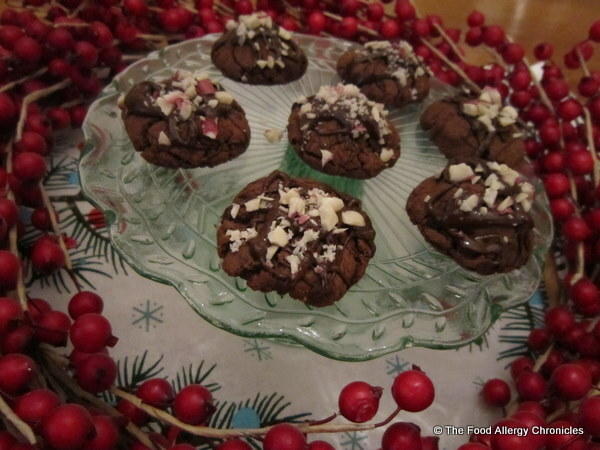 Dairy, Egg and Peanut/Tree Nut Free Double Chocolate Peppermint Crunch. They taste as good as they look. Crispy on the outside, minty and fudgey in the middle with an extra dose of chocolate and peppermint crunch on top…pure decadence! 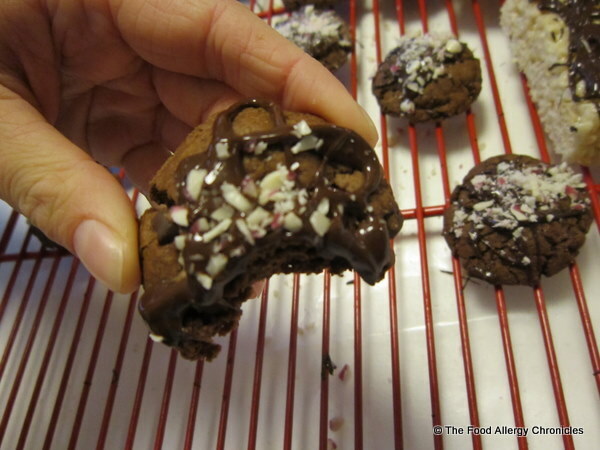 Truly, they should be renamed, Dairy, Egg and Peanut/Tree Nut Free Triple Chocolate Peppermint Crunch Cookies! 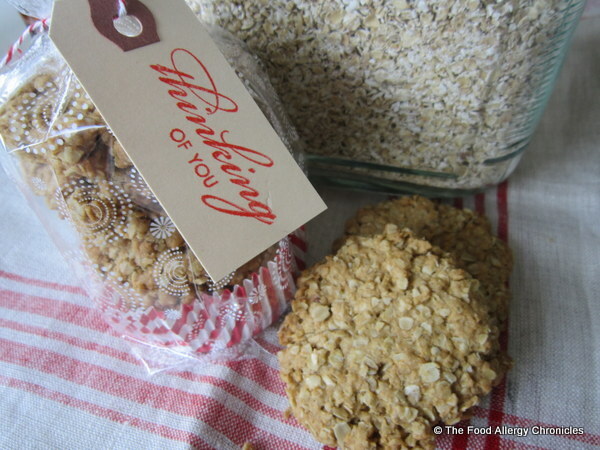 I adapted the original recipe (click here) to be dairy, egg and peanut/tree nut free. Replace the butter with Earth Balance and use Enjoy Life chocolate chips. Replace the egg with 1/2 tsp of baking soda and 2 tbsp of water. For a soy free version, replace the butter with Earth Balance’s Soy Free Vegan Spread. I baked these fudgy delights in the morning and had the boys help with the decorating after school. Matthew crushed the candy canes in a sealed plastic ziplock back with a rolling pin. Michael drizzled the warmed up chocolate over the cookies while Matthew followed with the sprinkling of the crushed candy canes. 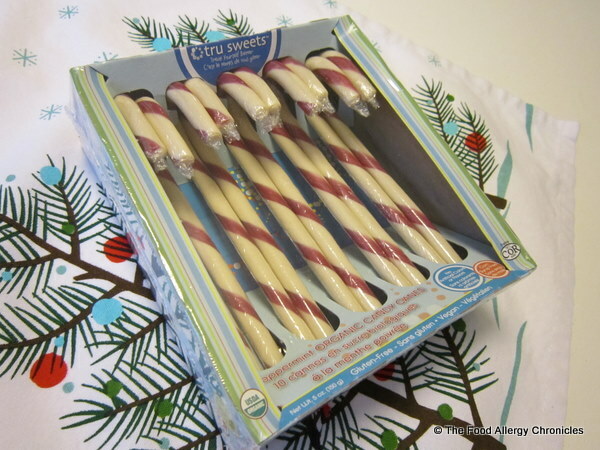 The Peppermint Organic Candy Canes are made by TruSweets. I like them because they are made in Canada with all natural ingredients, no artificial flavors or colors and are corn syrup free. It does state on the packaging: Produced on dedicated nut-free and gluten-free equipment in a segregated area of a facility that also processes dairy, eggs, peanuts, soy, tree nuts and wheat. Depending on your level of comfort, these Candy Canes are a great option for those looking for an allergen free alternative, free of artificial ingredients. 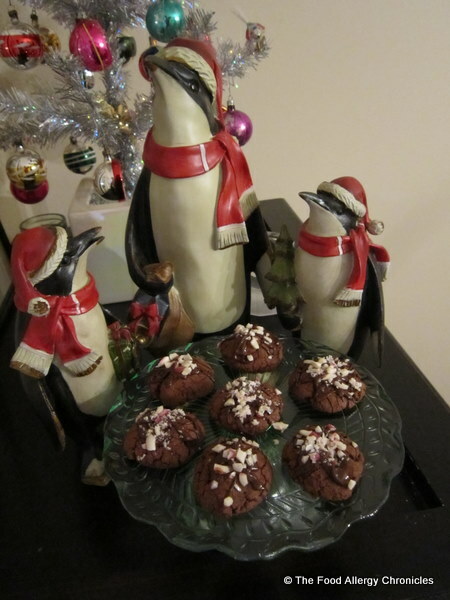 In the Christmas Spirit… I just couldn’t help but want to share these delectable Dairy, Egg and Peanut/Tree Nut Double (Triple) Chocolate Peppermint Crunch cookies with the boys’ friends and neighbours. Let’s not forget Matthew’s teacher…goes perfect with a Tim’s card! P.S. Don’t worry boys, I saved youl some Dairy, Egg and Peanut/Tree Nut Free Double Chocolate Peppermint Cookies.